This pristine river has long been recognized as one of Ontario's finest. The last native atlantic salmon in Lake Ontario were reportedly seen in this water course in the late 1800's. Drifting a roe bag through the gin clear waters of this fabled stream can be likened to the experience of fishing steelhead on Vancouver Island. Although sometimes crowded, you can usually have a good pool to yourself on a weekday. 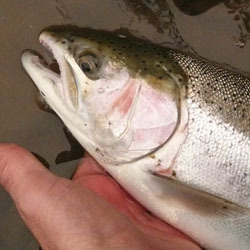 The run of steelhead is estimated to be in excess of 15,000, although these numbers may vary depending on the year. Most anglers use roe bags under floats, although small dark flies and single egg patterns also produce well. The season is open all year in the section of the Wilmot Creek South of the Railroad tracks and Highway #2. Northern sections are mostly on private lands except for a quarter mile section called the Thurne Park Conservation Area. This small area has a parking lot and allows fishing on both sides of the stream within the season. Light lines and discreet bobbers are a must in this river since the water is usually very clear. Finesse fishing with small flies and nymphs can entice a bite, especially at dawn. Recently with the stocking of atlantic salmon, anglers have been reporting catches of this majestic fish. Although still rare, this species has been slowly recovering with the help of conservation and protection. Also of interest is the fact that Wilmot seems to be the best river in Ontario for the natural reproduction of coho salmon. Favorite baits are roe bags and brightly coloured flies. The stream boasts a good run of Chinook salmon in the fall, although landing these brutes is challenging due to the many tree stumps and undercut banks which provide haven for these strong fighters. 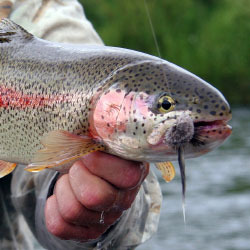 For more information on fishing Wilmot Creek visit www.WilmotClub.com. Each detailed map provides depth, contours, structure, boat ramps, and updated fishing information. Wilmot Creek fishing maps also include lake info such as gamefish abundance, forage base, water clarity, weedline depth, bottom composition, complete latitude/longitude grid lines and dozens of GPS waypoints & coordinates.